The curses of vengeful gods are difficult to break and our heroes will soon find out. 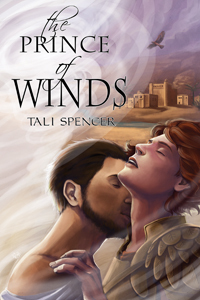 The Prince of Winds by Tali Spencer, available from Dreamspinner Press. Rimmon may be an eagle warrior, but he’s never known war, and he’s never known love—until his kingdom’s army is destroyed by Ekari, the demon of winds, and he is captured by Melkor, one of the Iron Horde that has been killing off the world’s gods. Those gods have cursed Melkor and his brothers to be conquerors and never to be loved, but Melkor, hoping to overcome his fate, carries Rimmon off to his island. There, he heals Rimmon’s wounds and teaches him about sexual pleasure, earning the young warrior’s trust and fanning the flames of an attraction both men yearn to embrace. But the curses of vengeful gods are difficult to break, especially when Rimmon discovers Melkor is the demon who destroyed his home. In the height of the Depression, Church and John are looking to escape. Maybe if Johnny’s lucky, Church will let him tag along. Call Me Church by Tinnean, available from Dreamspinner Press. Mordred falls in love with Alan, but the man of his dreams is something less—or more—than he anticipates. The Prince and the Program by Aldous Mercer, available from Dreamspinner Press. Aldous Mercer is celebrating the release of The Prince and the Program over at the Dreamspinner Press blog. There’s a $1000 Codebreaking Challenge – a cash award for the first person that cracks the Golden Egg that spans the entire length of the novel. There’s no time limit, the prize will be awarded whenever the Egg is cracked, now or ten years from now. Join Aldous through the day as he reveals some of the Eggs (helping you rule out some leads), plays a little bit of music for you, and talks about The Prince and The Program.